(Updated Wednesday, October 27) Jeff Malet, a photojournalist and performing arts photographer and a regular contributor to TalkingPointsMemo, the Huffington Post, Salon, and DC-area publications, was at the October 20th events welcoming Laird and Robin Monahan to Washington, and took these photos. John Leonhard took these photos (some are also in the slideshow in our post on the event). 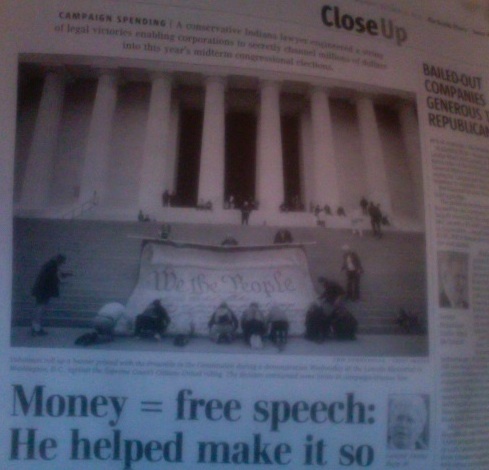 This photo of the event wound up in the Seattle Times, above an editorial on attorney James Bopp, who filed the lawsuit that led to the Citizens United decision and is now aiming at overturning campaign contribution disclosure laws in several states. 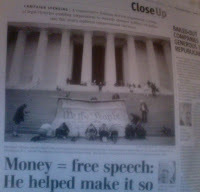 Laird's climb up the Lincoln Memorial Steps made "The Caucus Click" on the NYTimes Caucus blog. Ambreen Ali wrote an article about Laird and Robin's walk and their arrival in DC on Congress.org. David Swanson spoke at the event, and his remarks are posted here.